Kobe Bryant drives towards basket against Warriors. Kobe Bryant has the reputation of being the game’s best closer. On Wednesday night he didn’t disappoint, taking over the game in the final six minutes, and rallying the Lakers past the pesky Golden St. Warriors 115-110 at Oracle Arena. Bryant scored 17 of his game-high 39 points in the final 5:49, as the Lakers overcame an early 14-point deficit. He also had a crucial assist on a Ron Artest three-pointer with under two minutes left, that gave the Lakers a five point cushion. Bryant grabbed six rebounds, dished out four assists, and hit 13-21 from the field. But it wasn’t just the heroics of #24 that saved the Lakers on this night. Lamar Odom came off the bench to score 20 points, to go along with nine rebounds, and single-handedly kept the world champs in the game early in the fourth quarter, before Bryant came in and closed it out. Pau Gasol had another solid game with 24 points and 11 rebounds, and Andrew Bynum scored 11 points to go along with a game-high 14 rebounds. The Warriors led most of the game. They jumped out to a 37-23 lead in the second quarter, behind the sizzling shooing of Monta Ellis, who scored 21 of his 38 points in the first half. After the Lakers went ahead briefly at 43-42, the Warriors went on an 11-2 run to close the half and take a 53-45 to the break. In the third quarter quarter, the Warriors kept the pressure on the Lakers, keeping the lead between 6-8 points most the quarter. Ellis hit a buzzer-beating jumper that gave Golden St. a 75-69 lead after three. The fourth quarter turned into a duel between Ellis and Bryant, with the reigning 2-time NBA Finals MVP finally getting the better of his shooting guard counterpart down the stretch, hitting big shot after big shot, including a dagger three-pointer to put the Lakers up 105-99 with just over 30 seconds left. The Warriors hit several threes down the stretch, but the Lakers made all the foul shots for the win. Ellis for the game hit 15-26 from the field, and 4-5 from three-point line, playing all 48 minutes of the game. Dorell Wright also played the entire game, scoring 27 points to go along with seven rebounds, four assists, three steals, and two blocked shots. Stephen Curry had 15 points and 10 assists. Both teams shot the ball well, the Lakers hit 51.2% (42-82) from the field and 26-29 (89.7%) from the foul line. The Warriors shot 50.6% (44-87) from the field and a ridiculous 13-30 (43.3%) from beyond the arc. Los Angeles dominated on the glass 47-27, including 18 at the offensive end, which gave them a lot of second-chance opportunities, offsetting the massive three-point differential. And after turning the ball over frequently in the first half leading to 20 fastbreak points for the Warriors, the Lakers finished the game with a respectable 14 turnovers. The Lakers have now won six straight games, and are sitting in second place in the Western Conference, 4.5 games behind the San Antonio Spurs. They’re now 14-6 on the road, and have won eight of their last nine away from Staples Center. The champs next face the slumping New Jersey Nets on Friday night at Staples Center. The Lakers won the first meeting in New Jersey 99-92 back in early December, a game that was a lot closer than it should have been. Former Lakers Jordan Farmar and Sasha Vujacic will make their first appearances at Staples Center in uniforms other than purple and gold. Farmar will also receive is 2009-10 NBA Championship ring. 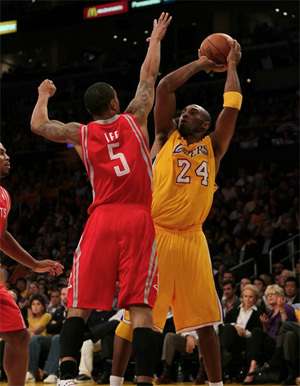 Kobe Bryant hits jump shot against Rockets. On a night where the Lakers of 2009-10 received their championship rings, it was a new Laker for 2010-11 who hit the biggest shot of the game, as the Lakers defeated the Houston Rockets 112-110 at Staples Center on Tuesday night to open the NBA season. Steve Blake hit the go-ahead 3-pointer with 18.8 seconds left on a pass from Kobe Bryant, and the Lakers, who seemed sluggish all night until late in the third quarter, escaped with the win. Blake in his Laker debut finished with 10 points on 3-5 from the field and 3-4 from beyond the arc. Shannon Brown also had an inspired game off the bench, as he poured in 16 points, including 4-5 from the 3-point line, and showed his much-improved outside shooting. He also had four steals, and was a key catalyst as the Lakers rallied from a 15-point deficit to take the lead early in the fourth quarter. The Lakers were able to surprisingly get back in the game with Kobe Bryant resting, as the bench took over in the third and fourth quarters. Blake and Brown each hit three 3-pointers in the final two periods, part of a big run that turned the tide. Kobe Bryant had 27 points and seven assists, as he continues to work his way back from off-season knee surgery. Pau Gasol led everybody in the game with 29 points and 11 rebounds. Lamar Odom added 14 points and 10 rebounds in a starting role for Andrew Bynum, as the center continues to rehab his knee. Early on the Rockets seemed determined to spoil the Lakers special night, as they shot over 50% from the field in the first half and led 62-51 at the break. They held a double-digit lead until the final moments of the third quarter, when Steve Blake hit back-to-back threes to draw the Lakers to within five. The Rockets would fall behind by as much as eight in the final quarter, but managed to pull ahead 110-109 on a Luis Scola layup with just under 30 seconds left. Bryant then drove to the rim taking defenders with him, and passed out to Blake, who hit a 3-pointer from out front that put the Lakers ahead for good. The Rockets had two chances at the end to tie or win the game, but were unable to get good looks at the basket. The Lakers next game is Friday night in Phoenix, where they will face an Amar’e-less Suns team for the first time.